Scrapped in 1948 at Philadelphia. Depth of hold 27' 3"
54k In port, probably at New York when she was inspected there on 21 November 1917. Dictionary of American Naval Fighting Ships History: Severance was built during 1909 by Ropner & Sons, Stockton-on-Tees, England, as the steel, single-screw freighter, Gladstone; was subsequently renamed Martin Quezada and, still later, Severance, was acquired by the United States Navy on 9 August 1918 from the Union Sulphur Co., of New York City, for service in World War I, and commissioned at New York on 19 August 1918, Lt. Comdr. J. F. Bock, USNRF, in command. Assigned to the Naval Overseas Transportation Service (NOTS), Severance, carrying locomotives and general cargo, departed Norfolk on 7 September 1918 in convoy for Brest, France. Subsequent to returning to New York on 2 November, she sailed on 4 December for her only postwar transatlantic voyage for NOTS. She reached Quiberon Bay on the 23d and proceeded to St. Nazaire. Departing that port on 25 January 1919, Severance called at Bermuda before arriving at Philadelphia on 25 February. 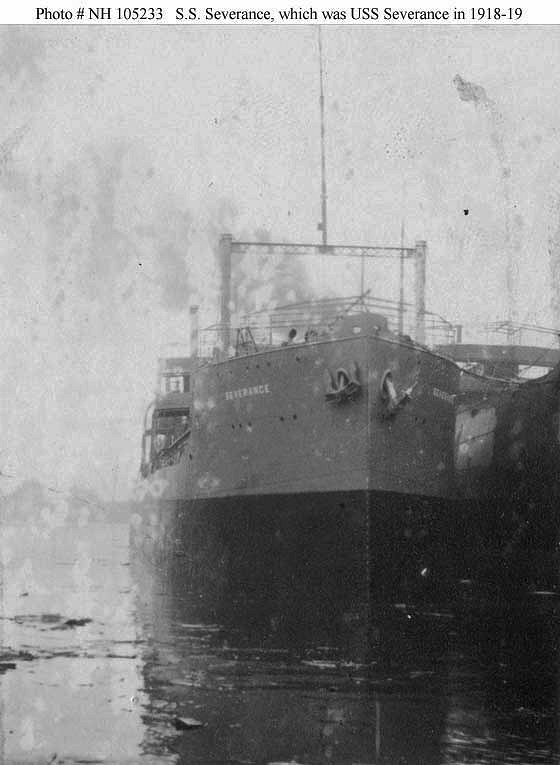 She was decommissioned and transferred to the United States Shipping Board on 3 March 1919 for simultaneous return to her owner at Pier 78, South Wharf, Philadelphia.